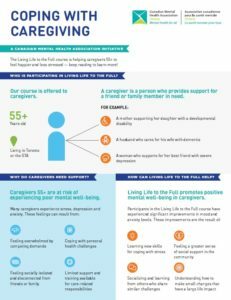 Click on the image to download the LLTTF for Caregivers infographic. CMHA Ontario and our partners are excited to offer this course (valued at $185 for the 8-week program) for free to caregivers aged 55+ living in Toronto as part of the ENRICHES Collaborative. This fun and interactive course is offered to groups of 10-15 people in community settings. Download the course brochure (PDF), or download an infographic on the program. Those considering registering for a course should remember that caregivers are anyone supporting a family member or friend. Instead of caregiver, we may use words like sister, daughter, parent, or friend to describe ourselves. Some examples of individuals that may benefit include: a father caring for his child with Schizophrenia, a daughter taking care of her aging parent, a wife supporting her husband with dementia. The following courses are open for registration, and are being offered for free for caregivers 55+. To register, or for more information on a course, please see the contact information listed below the course you are interested in. Questions about this project? Please contact 416-977-5580 ext 4135 or hroussel@ontario.cmha.ca. 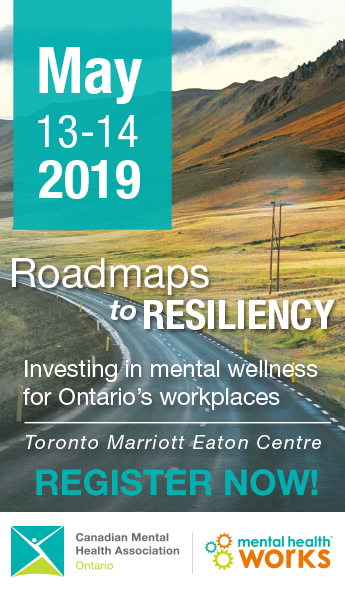 If you are an organization interested in hosting a workshop, or a caregiver aged 55+ interested in putting your name on our wait list, please contact 416-977-5580 ext 4135 or hroussel@ontario.cmha.ca. Location: Rexdale Community Health Centre, 8 Taber Rd. February 28th – April 18th 2019 (Every Thursday) . Living Life To The Full initiative for caregivers 55+ have moved caregivers and partner agencies beyond learning concepts and information sharing. The initiative supported and guided 122 participating agencies at local level on how to successfully implement our programs, connect themselves to valuable support and resources in mental health, and bring 960 caregivers participants on a journey to self-care, self-discovery, self-mastery, and social inclusion. For more information this section will offer you testimonial videos, final report infographics and a full research report from Dr. Nasreen Khatri, Principal investigator from The Rothman Research Institute, Baycrest who was the researcher supervising the research of this project. Living Life To The Full for caregivers 55+ was part of the ENRICHES impact collaborative and was funded in part by the Government of Canada New Horizons for Seniors Program. View testimonials about our French course below. This project is funded by the Employment and Social Development Canada, New Horizons for Seniors Program.